Dahshur Pyramids are an astonishing necropolis, which has yet to gain popularity among tourists in Egypt. Although less known, Dashur and its magnificent specimens of Egyptian architecture is no less impressive than those at Giza. An additional plus is that they are built entirely on the model of the pyramids in Dashur . The complex is located about 40 km south of Cairo and is the second largest necropolis in Saqqara after Giza. Here there are 5 pyramids, 3 of them are larger and newly available for visits. From 1979 Dashur with the necropolis at Giza are included in the list of Colors cultural heritage. The two main pyramids in Dashur are built for Pharaoh Snofru. The first one is a 100-foot Bent Pyramid, located in the necropolis near the small village of the name Dashur. To this day, the Bent Pyramid is developed by the archaeologists who discovered more and more interesting artifacts here. Bent pyramid was built 4600 years ago by Pharaoh Snofru, who was the father of Cheops, assuming that it was intended for his tomb. In fact Snofu leaves behind far more amazing Egyptian buildings than Cheops, although the latter is more popular. 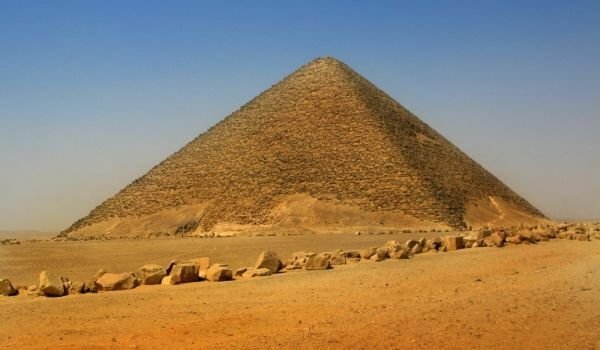 It is assumed that the Bent Pyramid of Dashur is the sarcophagus of Snofru, but still it is not open - the pyramid is an extremely complex maze of corridors, which is still under investigation. The name of the Bent Pyramid of Dashur comes from the fact that the angle of the walls at the base starting from 54 degrees, but later was changing to 43 degrees. It is possible that the relatively sharp angle of the walls of the pyramid is a partial cause of its collapse, because they had to make changes to the project at the southern pyramid of Dashur. Originally it was designed as a very steep building, but later architects realized the danger of collapse and decided to rise it up and the top at a less acute angle. This pyramid is associated with an underground corridor to the pyramid in which is buried the wife of Snofru. The purpose of this path is so the Pharaoh can visit his favorite in the afterlife. This imperfect construction of Dashur deeply disappointed Pharaoh and he decided to abandon the Bent Pyramid. Before him a new project was formed, namely the construction of another tomb, which is now known as the Red Pyramid at Dashur. It is the fourth largest in Egypt after the Giza two, it is built at the lower slope of 43 degrees. In those ancient times, however, the Red Pyramid had no equal in size and in general was the highest building in the world. Experts say the Red Pyramid is the first successful attempt in history, to construct the pyramid with smooth sides. Its name comes from the red rocks that it is built from. In fact, this building in Dashur was not always red, as in the beginning it was covered with limestone. In the midlle ages much of the white limestone is robbed for the construction of new buildings in Cairo. About 100 km south of Cairo can be seen another pyramid built by Snofru. It is known as the Pyramid of Meydum and is located in Meydum. It is assumed that it was built by the father of Snofru - Huns and it was quite large. Built on 7 levels, of which today only 3 remain.